Southern Minnesota is stuck in a bad late fall/early winter rut. I say this because tonight and tomorrow we’re in for yet another weekend snowstorm, with ice and up to a foot of snow possible for some areas (including the Twin Cities). Last weekend we received somewhere between eight and ten inches in St. Peter, but during the week we had fairly nice (yet chilly) weather with mostly sun and only a few flakes. Tomorrow’s storm might prove to be a monster compared to our previous ones however, as the wind is supposed to come howling out of the north-northwest, which in turn means horizontal snow and very low windchills (down to -30!). And, as if that wasn’t enough, the actual air temperature is supposed to reach only -1 degrees Fahrenheit on Sunday! Thankfully the rest of the week afterward looks sunny and a little bit warmer (relatively, of course), until we get to next Saturday, which appears to already have been forecast with a 60% chance of snow. In case anyone is questioning whether this is a normal pattern for this time of year, the answer is an emphatic “NO!” Especially in terms of the previous three or four winters, which exhibited mostly warm (above freezing) temperatures throughout much of December before giving way to a colder and relatively dry January and February, this winter is a bold outlier. The Pacific Ocean is currently in the “La Niña” phase of the El Niño-Southern Oscillation, which is a general cooling period opposite an “El Niño” warming period, which partly explains the unusually cold and wet weather that much of the continent has been experiencing over the past month. This Pacific cooling period, according to the National Oceanic and Atmospheric Administration (NOAA), is expected to last into spring of 2011, so in all probability we’re not done yet. To learn more about the El Niño-Southern Oscillation, check out http://en.wikipedia.org/wiki/El_Ni%C3%B1o-Southern_Oscillation. 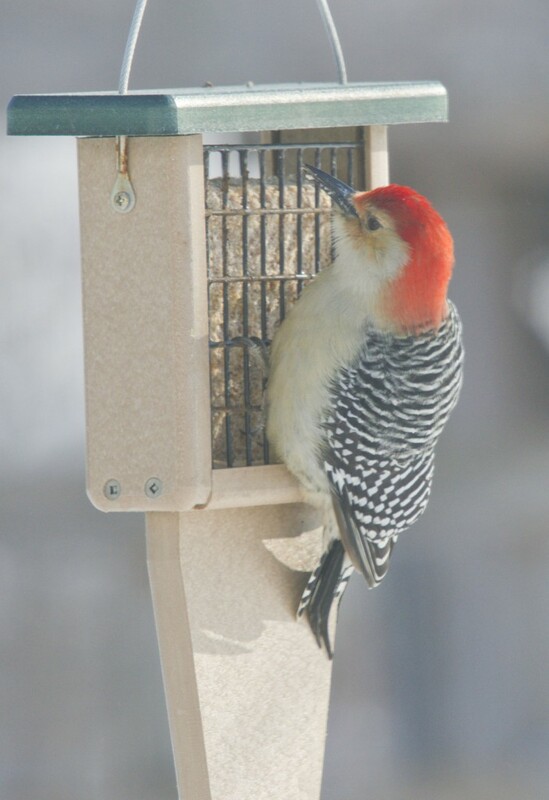 Male Red-bellied Woodpecker at suet feeder behind Interpretive Center, 12/6/10. Photo taken through window.